In this page, we will learn Struts 2 JSON integration using annotation. Struts 2 supports JSON response using JSON plugin. We need to use json-default as parent package. The action method should return result as json type. To achieve it we need to define result type as json. Find the sample example step by step. 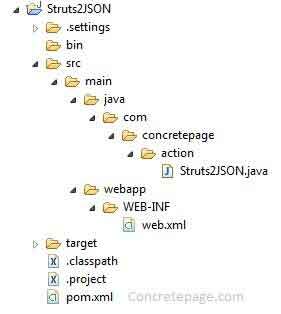 Find the project structure in eclipse for struts 2 and JSON integration. To support JSON, we need to use json-default in parent package. Use below annotation in the action class. The return type of action method should be JSON. To achieve it, struts 2 provides json type in result. Define it as below. Now find the action class where we are generating a sample JSON. We can use collection to create the required JSON. To get the output create setter and getter method of the property. Find the pom.xml that is being used in example to resolve struts 2 JAR dependency. Find the screen shot of the browser.